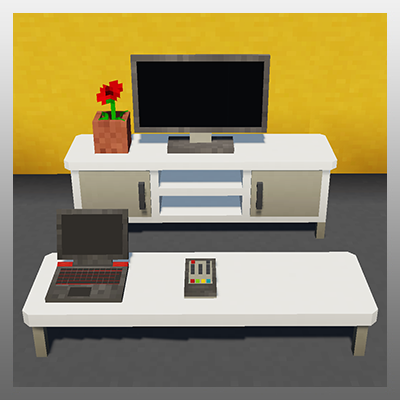 This mod adds in what Minecraft has been missing for years, furniture! It includes over 80 unique pieces of furniture to decorate your bedroom, kitchen, living room and even your garden! Turn your house into the dream house you have never been able to have until now. Can't turn on some lamps and some items are not working (including lamps). They loo like they are made of water / ice and are transparent. I'm using Forge and SEUS PTGI and we're playing on our own server that I'm hosting, could that be it? I'm stupid. I installed SEUS Renewed and they are working now. I guess the issue is with SEUS PTGI, but still...does anybody know how to fix them on SEUS PTGI? TV's only seem to work when in creative mode.. Can't find any configs to change. What ar I du wrong? I need muh TV for .. reasons. Sliding doors aren't reacting to pressure plates or any other redstone signals. Using the latest version, tested both in single player and on servers. I really want to play gifs larger than 2 mb can u make a config option for this? Hey can you do a medieval version of the mod plz ? Are these able to run on a server? I have a forge server and I'm trying to add a few "aesthetic" mods going. I have them where they should be but I either can place the blocks but people who arent local can't play or the mod blocks arent usuable with other people (even when they have the mods themselves installed). If anyone can assist me that would be awesome. I have discord if that helps. I've gotten some error messages too that I'm not quite sure how to troubleshoot. Are you sure about that? I use bibliocraft with it and it works just fine. yes i'm sure, i delete bibliocraft and its working, also reverse. I don't know much on coding, so all I can say is test each and every mod with this mod. It might be that one of your other mods not getting along with one of them. I think (don't quote me on any of this, I am just trying to help as of my knowledge) it may be due to galactic craft, or too many mods. In 1.12.2, Minecraft has an ID limit that has been exceeded. The crash says "Invalid id 4096 - maximum id range exceeded." and says alongside this "* Optifine is installed. This is NOT supported. This may (look up the meaning of 'may' in the dictionary if you're not sure what it means) have caused the error. Try reproducing the crash WITHOUT this/these mod(s) before reporting it." I would try to make sure you have the correct versions of all mods, make sure they are all updated and from the official websites. Make sure you download all mods from the correct website/page as some websites can be 3rd party hosts, giving you malware, adds, viruses or other miscellaneous programmes. If you would like to learn more or download the browser add-on, please visit Stop Mod Reposts. If the mods are all from the official sites and are all updated, try removing big mods in order to downsize the ids in-game. If you have tried the above two steps, please use the step below. If nothing has worked, try updating forge while sticking to the above two steps/areas/sections. Please do not try to use me for handy advice as I am not good at this stuff either, just basing it from my knowledge. It extends the maximum IDs from 4096 to 65536. It worked for me when I got a similar crash. Why is it so difficult to play a gif on the TV?